A good number of purchasers claim that the Under Armour NXT is made of premium materials. Several buyers say that the flap style of the tongue is dope. Many users take note of the comfort that they experience from the Micro G midsole. The insole of these basketball shoes from Under Armour model feels premium. The yarn embroidery that coats the mesh upper is liked by many users. The thick padding in the inner wall of the shoe provides much-needed support. Most buyers enjoy the versatility of the UA NXT. A good number of shoe owners agree that the rubber can withstand outdoor courts. A shoe owner claims that the forefoot area wore off after just a few uses. At least two wearers claim that the Under Armour NXT runs narrow. A handful of buyers think that how the shoelaces are positioned is awkward and unsightly. The inner wall of the heel counter causes blisters, say a couple of wearers. Overall, the Under Armour NXT is a great performance shoe. Its aesthetic appeal has scored points with most wearers. Given its price, the support provided by this mid-top shoe is a huge bonus. The majority of shoe owners just love the UA NXT so much that they recommend the shoe to new buyers. It plays like a good budget model. The Under Armour NXT is a budget basketball shoe model with a mid-top silhouette. The mesh upper provides a good amount of breathability. The mesh has TPU coating on high-wear spots for extra durability. The outsole has a herringbone traction pattern for good stopping power. The midsole setup has an EVA insole, Micro G foam, and Charged cushioning. They provide ultimate comfort, support, responsiveness, and a low-to-the-ground feel. Since the NXT is a mid-top shoe, Under Armour offers the HOVR Havoc for high-top and the sixth signature shoe of Warrior’s star Stephen Curry for the low-top version. Cushion. The outstanding responsiveness of the Under Armour NXT comes from the full-length Micro G foam carrier with Charged cushioning. Micro G is a proprietary foam technology that also provides a low-to-the-ground ride. It is 30% thinner than other standard foams, making it lighter and pretty much supportive of quick direction changes. The Charged cushioning, for its part, also delivers step-in comfort. The overall cushioning setup of the UA NXT provides an absolute combination of support and explosiveness on court. Traction. The Under Armour NXT comes with a full-length herringbone pattern that extends to the sides for stability. The forefoot area has an anatomical groove that provides flexibility. The traction pattern has thick deep grooves for maximum floor control and grip. Length and Width. Like other shoe brands, Under Armour designs shoes in the standard measurements. However, a handful of UA NXT shoe owners claim that the shoe runs narrow. In cases like this, the best recommendation for new buyers is to fit the shoe prior the purchase. Lockdown. The Under Armour NXT is equipped with UA’s webbed-loop system for speed lacing. The upper features an asymmetrical “burrito” tongue that keeps the foot in place by wrapping around it, hence its “burrito” name. The upper of the Under Armour NXT is made of breathable mesh with yarn embroidery. The upper has a protective TPU coating on high-wear spots. To protect the shoe from toe drags, the toe cap has an abrasion-resistant TPU. 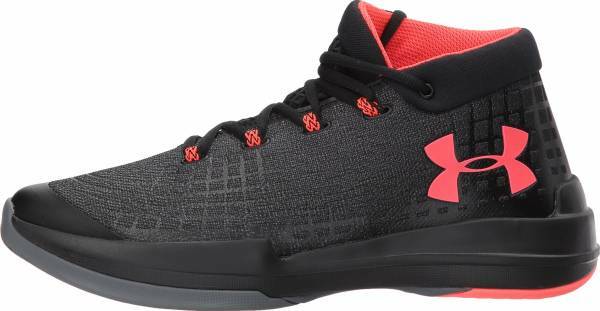 The Under Armour NXT is a mid-top basketball sneaker that comes in different colorways. The prestigious logo of the brand is found on the tongue top, outsole, and insole. The shoe model can be worn with jeans or shorts. The neat ombre upper will look presentable for parties and gatherings.